A carjacking in Montebello, in which a shotgun was pointed at the victim, led Wednesday to a vehicle pursuit in Rosemead and the arrest of a Temple City man. Officers responded about 5:55 a.m. to a report of a carjacking that had just occurred in a residential neighborhood on Germain Drive, according to Montebello police Detective Craig Adams. The suspect, later identified as 30-year-old Erik Alvarez, allegedly pointed a shotgun at a motorist and forcibly removed him from his white Ford Edge, Adams said. Alvarez was tracked to an address in Rosemead, where he was found inside the Ford, Adams said. “Officers attempted to conduct a high-risk stop, however the suspect failed to yield and a pursuit ensued,” he said. The suspect drove through Rosemead and onto the westbound San Bernardino (10) Freeway, where he was involved in a non-injury collision, before stopping on Walnut Grove Avenue, according to the detective. “Evidence connecting the suspect to the carjacking was located at the suspect’s residence,” Adams said. Alvarez, who was arrested about 10:20 a.m., was booked on suspicion of carjacking, possession of stolen property and felony evading, Adams said. He was being held in lieu of $100,000 bail, with an initial court date scheduled for Thursday in downtown Los Angeles, according to sheriff’s inmate records. 6pm–Sanctuary Town Hall Meeting Presented by Indivisable Highland Park. Organizers will discuss why Sanctuary City designations work, are in demand and possible in L.A. Speakers include CD-1 Councilman Gil Cedillo, labor leader Maria Elena Durazo, and immigrant rights leader Angela Sanbrano. Location: SEIU 721, 1545 Wilshire Blvd., LA 90017. For more info, call Office of Councilman Cedillo at (213) 473-7001. 8-10am–Join the Montebello PD for Coffee With a Cop at the Starbucks at 800 W. Beverly Blvd. Meet local police officers, discuss local issues. Officers will be selling patches & shirts to support Pink Patch Project for breast cancer research & awareness. For more info, call (323) 887-1313. 11am-1pm–AltaMed Health Services to Host Free Citizenship Workshops in South Gate. During the workshop, individuals will learn about the naturalization process to become a U.S. citizen and screened for eligibility. Attendance is free. Location: AltaMed Clinic, 8627 Atlantic Ave., South Gate 90280. Individuals who decide to move forward, can make a reservation to attend AltaMed’s “Application Workshop” on Saturday, Oct. 14th and receive help filling out the application. Registration is required to attend, call (818) 937-2867 to reserve a spot. Peace March, Oct. 14 in Lincoln Heights. Join Lincoln Heights Clergy, Councilman Gil Cedillo, Mayors GRYD Office, LAPD and & community leaders for a peace march and resource fair. March starts at 9am at the Boys and Girls Club, 2635 Pasadena Ave, LA 90031. A Resource Fair, free food, and swimming will follow march at the B & G Club. For more info, call (323) 221-9111. Los Angeles Derby Dolls’ 9th Annual Health Fair Oct. 14 at the El Sereno Senior Center. Free blood pressure &glucose screenings, flu shots, child safety seat inspections & more. Time: 10am-2pm. Senior Citizen Center located at 4818 Klamath Pl, L.A. 90032. For more information, call (323) 222-2040 or to schedule a safety seat inspection. call (310) 318-5111. Free Visual Car Inspection Oct. 21 at the Highland Park Senior Center. Visual inspection includes lights, wipers, belts, hoses, vehicle battery & much more. Time: 9am-1pm. Senior Center located at 6152 N. Figueroa St. Highland Park, 90042. For more info, call (323) 255-7913. Advertise your event in EGP’s print and online Community Calendar for one low-price. For more information, email advertise@egpnews.com or call (323) 221-1092. To submit an event for the Community Calendar, email calendar@egpnews.com by Friday, 5p.m. for the next Thursday issue. Space is limited. Immigration and Customs Enforcement (ICE) officers descended on a number of Southern California communities last week, spreading fear that mass-deportations were underway across Los Angeles County, home to nearly 1 million undocumented immigrants. Rumors of local police cooperating with ICE officers spread quickly, especially in working class, immigrant communities where distrust of police is in some cases already high. Since 2014, the California Trust Act has prohibited local jails from holding people under arrest for longer periods than charges require just to give ICE more time to decide whether to take the person into custody. The two largest law enforcement agencies in the region, the Los Angeles County Sheriff’s Department and the Los Angeles Police Dept., have both said they will not act as “immigration agents” or cooperate with federal immigration officers. Smaller police forces, many in cities with large numbers immigrant residents or in the case of Vernon, workers, also say they want to leave immigration enforcement to federal authorities. Vernon Police Chief Daniel Calleros told EGP he was surprised to hear that one of last week’s raids took place in nearby Downey. He said the Vernon Police Department has no plans to assist ICE with such raids or to detain people in the country without authorization until ICE can take them into custody. Calleros said immigration issues are not an area the city gets involved in. “We don’t ask if you are here illegally, that’s not our job,” he explained, saying it’s the job of the federal government. He added that Vernon Police would only assist ICE if it were a matter of public safety. In neighboring Bell Gardens, police Chief Robert E. Barnes also told EGP his department does not get involved in immigration-related matters. He clarified, however, that some Bell Gardens PD detectives work with ICE agents as part of the Los Angeles Interagency Metropolitan Police Apprehension Crime Task Force (L.A. IMPACT), which investigates major narcotic crimes. Barnes acknowledged that some of past mistrust of Bell Gardens police might still linger in the working class, predominately Latino southeast city. “We used to have issues with DUI Checkpoints,” he said, recalling that some people believed the checkpoints were really a pretense for checking a person’s immigration status. But “that’s not even on our radar” these days, Barnes said. When asked about the Montebello Police Department’s stance on immigration during the city’s first-ever virtual neighborhood watch meeting last week, Sgt. Marc Marty said a person’s immigration status does not change anything. Nearby Commerce contracts with the LA County Sheriff’s Department for its policing services, and therefore falls under that department’s guidelines when it comes to immigration enforcement. Sheriff Jim McDonnell has on numerous occasions sought to assure immigrants that the LA County Sheriff Department is committed to helping all people regardless of their immigration status. He’s emphasized that deputies do not participate in the process of determining the immigration status of people in their custody, or that of crime victims. Both Calleros and Barnes told EGP they have not received any calls related to the raids from residents or businesses in their respective cities, despite rumors of local police in some areas assisting in immigration checkpoints that have since been discredited. Both police chiefs did say however, there is one phone call they hope to get should ICE decide to conduct similar operations in Bell Gardens or Vernon. “I hope that if they do come into our city they give us a courtesy call so we have an idea of what’s going on,” said Calleros. Montebello residents who want to attend a citywide Neighborhood Watch meeting will no longer have very far to go. Last week, the Montebello Police Department held their first-ever virtual Neighborhood Watch meeting on Facebook Live, bringing the community-based, crime prevention program right into residents’ homes, or wherever they access the popular social media site. Sgt. Marc Marty, Corp. Maria Chavez and Officer Scott Howard, who make up Montebello PD’s Community Relations Unit (CRU), answered questions and addressed the concerns posted by dozens of viewers watching the live event on Feb. 8. Sgt. Marty explained they got the idea for hosting the virtual meeting after seeing how a larger social media presence resulted in a bigger turnout at the department’s annual National Night Out event last August. The CRU – or “crew” as they pronounce it – explained that their role is to build a better relationship with the community. While one of the community relations unit’s goals is to improve communications between the police department and the public, other top objectives include crime prevention and educating the public on what they can do to help officers do their job. To that end, residents will next month have an opportunity to meet the officers in person during a Neighborhood Watch seminar March 1 at the city’s senior center. Officer Howard explained the event would provide residents with tips and tools on how to start a Neighborhood Watch on their residential block. The department is encouraging the city’s large Spanish speaking population to attend, and has arranged to provide translation services for those who need it. During last week’s Facebook Live Neighborhood Watch event, many of those who posted comments expressed concern over recent vehicle break-ins. Howard attributed some of that rise to reduced jail sentences brought on by Proposition 47. “We can’t change that, but what we can change is to help prevent the crime from happening in the first place,” he said, emphasizing the importance of checking to make sure car doors are locked and removing valuables from vehicles. “You are one broken window away from everything being taken,” Howard reminded viewers. Officers also answered questions about the city’s growing homeless population, speeding, double parking and 911 calls. “We are doing our best with the man power we have,” said Marty, explaining that the department is down 17 officers. The city currently has nine open officer positions and eight current officers are either out for training or injured, he said, noting that fewer officers on duty makes their job harder. He assured, however, that officers with the community relations unit are not just sitting in an office; They still monitor the radio and respond to calls, he said. The officers encouraged residents to volunteer for citizen patrols and to attend upcoming training sessions to help with patrolling. The live-streamed event also received comments from people not all that happy with the department, but even then, the three officers answered questions about police beatings and racial profiling. Howard advised viewers to take a video and to call the police department and ask to speak to the watch commander if they believe they have witnessed an officer mistreating someone. Many of those posting comments said they are happy to see the department being progressive and thinking outside the box. “Thanks for doing this! Dragging Montebello into the 21st century,” wrote Diana Ashkenasy. “Thank you for reaching out to the community and for your service day in and day out,” wrote Helen Ligh. Officers advised viewers of other resources available to them, recommending they sign up for the free Nixle alert system used by many law enforcement and emergency service agencies, and the neighborhood connection app Next Door. They also urged residents to follow the Montebello Police Department on Facebook and Twitter, adding they plan to continue interacting with the public in other ways, such as attending chamber events, visiting businesses. The department is also in the process of getting their website built, according to Marty, who said they hope to create a central hub for all the information they distribute. With thousands of views, Marty said the department plans to hold more live events in the future. Los residentes de Montebello que quieran asistir a una reunión de la Vigilancia de Vecindarios de la ciudad ya no tendrán que viajar muy lejos. La semana pasada, el Departamento de Policía de Montebello celebró su primera reunión virtual de vigilancia del vecindario por medio de Facebook Live. Con esto, ellos presentaron el programa de prevención de delitos basado en la comunidad directamente a los hogares de los residentes o donde quiera que se pueda acceder al popular sitio de medios sociales. El Sgt. Marc Marty, la Corp. María Chávez y el oficial Scott Howard, quienes componen la Unidad de Relaciones Comunitarias (CRU) de Montebello PD, respondieron a las preguntas y abordaron las preocupaciones de decenas de espectadores que se sintonizaron al evento en vivo el 8 de febrero. Sgt. Marty explicó que se les ocurrió la idea de acoger la reunión virtual luego de ver cómo una presencia social más grande en los medios resultó en una participación mayor en el evento anual del departamento, “Noche de Salida Nacional” (o “National Night Out” en inglés) el agosto pasado. La CRU -o “crew” al pronunciarlo en inglés- explicó que su función es construir una mejor relación con la comunidad. “No es que nuestra relación sea mala, pero creo que tenemos que seguir construyendo el diálogo”, dijo Marty a su audiencia virtual la semana pasada. “Aquí es dónde empezamos el diálogo, pero lo seguimos cuando los vemos en público”. Mientras que uno de los objetivos de la unidad de relaciones comunitarias es mejorar las comunicaciones entre el departamento de policía y el público, otros objetivos principales incluyen la prevención del delito y el educar al público sobre lo que puedan hacer para ayudarles a los oficiales a desempeñar su trabajo. Con ese fin, los residentes tendrán la oportunidad de reunirse con los oficiales en persona durante un seminario de Vigilancia Vecinal el 1 de marzo en el centro para ancianos de la ciudad. El Oficial Howard explicó que el evento proporcionaría a los residentes consejos y herramientas sobre cómo iniciar una Vigilancia de Vecindarios en su bloque residencial. El departamento está animando a la gran población de habla hispana de la ciudad a asistir, y ha dispuesto proporcionar servicios de traducción para aquellos que lo necesiten. Durante el evento, Facebook Live Neighborhood Watch de la semana pasada, muchos de los que publicaron comentarios expresaron su preocupación por los recientes allanamientos de vehículos. Howard atribuyó parte de ese aumento a las penas de cárcel reducidas provocadas por la Propuesta 47. “No podemos cambiar eso, pero lo que podemos cambiar es ayudar a prevenir que ocurra el crimen en primer lugar”, dijo, enfatizando la importancia de revisar para asegurarse de que las puertas de los automóviles permanezcan cerradas y el quitar objetos de valor de los vehículos. “Están a (un paso) o a una ventana rota de que les roben todo”, recordó Howard a los espectadores. Los oficiales también respondieron a preguntas sobre la creciente población indigente de la ciudad, el exceso de velocidad, el estacionamiento doble y las llamadas al 911. “Estamos haciendo todo lo posible con el personal que tenemos”, dijo Marty, explicando que el departamento tiene 17 puestos de oficiales vacantes. La ciudad tiene actualmente nueve puestos de oficiales abiertos y ocho oficiales actuales están fuera para entrenarse o están heridos, dijo, señalando que la cantidad pequeña de oficiales de guardia le dificulta su trabajo. “Aquellos que estén preocupados por no ver suficientes oficiales en patrulla, la verdad del asunto es que no tenemos muchos oficiales disponibles”, dijo Marty. “No son tantos como la gente piensa”. Aseguró, sin embargo, que los oficiales con la unidad de relaciones con la comunidad no están simplemente sentados en una oficina; Todavía vigilan la radio y responden a las llamadas, dijo. Los oficiales animaron a los residentes a ofrecerse como voluntarios para las patrullas ciudadanas y a asistir a las próximas sesiones de entrenamiento para aprender a cómo patrullar. El evento transmitido en vivo también recibió comentarios de personas que no estaban satisfechas con el departamento, y aun así los tres oficiales respondieron a las preguntas sobre los golpes policiales y la discriminación racial. Howard aconsejó a los televidentes a tomar video y llamar al departamento de policía y pedir hablar con el comandante encargado en ese momento si creen que han sido testigos de un abuso policial. “Si ve algo, repórtelo”, dijo Marty. “No encubrimos nada”. Muchos de los que publicaron sus comentarios dijeron que están felices de ver que el departamento sea progresista y que esté pensando con originalidad. “Gracias por hacer esto! Están arrastrando a Montebello hacia el siglo XXI “, escribió Diana Ashkenasy. “Gracias por llegar a la comunidad y por su servicio día tras día”, escribió Helen Ligh. Los oficiales aconsejaron a los televidentes de otros recursos disponibles, recomendándoles que se inscriban al sistema de alerta gratuito Nixle usado por muchas agencias de servicios de aplicación de ley y de emergencias. Otra aplicación de conexión de vecindario disponible es Next Door. Ellos también instaron a los residentes a seguir el Departamento de Policía de Montebello en Facebook y en Twitter, agregando que planean continuar interactuando con el público de otras maneras, asistiendo a eventos de la Cámara, y visitar a las empresas. El departamento también está en el proceso de obtener su propio sitio Web, y de acuerdo con Marty, se espera que sirva como un eje central para toda la información que distribuyan. Con miles de opiniones, Marty dijo que el departamento planea celebrar más eventos en vivo en el futuro. “Estamos tratando de ser transparentes”, dijo. “Queremos mostrarte que somos tan humanos como usted”. Montebello police Monday appealed to the public for help in finding a hit-and-run driver who collided with a bicyclist, who died of his injuries two days later. The collision occurred shortly before 10 p.m. last Wednesday. Police found the bicyclist near the north curb line of Whittier Boulevard, west of Bluff Road, but the motorist had fled. Steven Garcia, 24, of Montebello, was taken to County-USC Medical Center, where he died on Friday. Police said the suspect vehicle was believed to be a Ford truck and asked anyone with information to call investigators at (323) 887-1212, ext. 353 or 337. 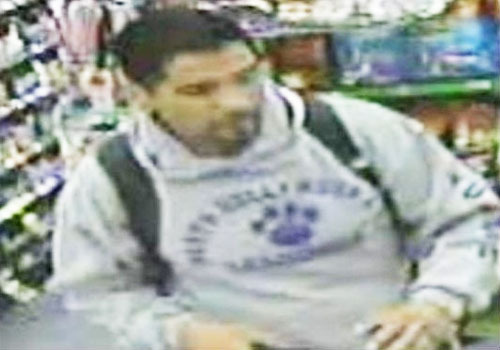 Police circulated an image of a man Friday, suspected of trying to sexually assault a female he met at a bus stop in Montebello. The victim was waiting for a bus in front of a Chevron station at 1500 Paramount Blvd. about 7:30 a.m. on March 11 when she was approached by an unknown man who talked with her and persuaded her to accompany him to another stop where they could catch the bus sooner, according to Montebello police. The man then led the victim into a secluded landscaped area between the Pomona (60) Freeway and The Shops at Montebello at 2134 Town Center Drive, police said. “Once there the suspect attempted to sexually assault the victim,” according to a police statement. “The victim successfully fended off the attack and fled the area.” The suspect was described as Latino, 30-40 years old, 5 feet 6 inches tall, 130 pounds with black hair and a goatee. He was wearing a gray hoodie with blue writing, black shorts and was carrying a dark-colored backpack. Anyone with information about the suspect was urged to contact Montebello police Detective R. Zabala by calling (323) 887-1200 or sending an email to rzabala@cityofmontebello.com. Anonymous tips can be provided by calling Crime Stoppers at (800) 222-TIPS. Dozens of Montebello Police officers hit the streets last week in search of high risk DUI offenders with outstanding warrants. Officers served warrants and arrested three offendors who failed to show up for court or violated their probation with an outstanding DUI case. Montebello Police has focused on removing impaired drivers from the streets, placing a priority on lowering deaths and injury by heightening awareness of the dangers of driving under the influence of drugs and alcohol. Funding for the operation was provided by a grant from the California Office of Traffic Safety through the National Highway Traffic Safety Administration.